Here’s the thing: This isn’t what could be considered a great episode of The Vampire Diaries. It might not even really be a good one, in comparison to the show’s glory days. But in this season that’s struggling to find a clear, workable direction, “Live Through This” at least had the structure and feel of a good installment of The Vampire Diaries, even if that structure and feel are hiding the fact that the stories are still fairly weak. For now, that just might be good enough to get by. Let’s begin with the big, wild reveal that starts the episode because it was certainly big and wild. This week’s flash forward moment focuses on Bonnie, who we discover is in some sort of either rehab or mental health treatment facility, mourning someone she loved that she lost because of a mistake she made. There is a whole lot of baggage wrapped up in the show’s decision to make Bonnie’s future moment such a sad and defeated one—baggage that I hope we’ll get to discuss once the purpose of these future scenes become more clear—but this potential baggage gets quickly swept under the rug when the show reveals that Bonnie and Enzo are an item in the future. This is literally so weird and insane that my brain cannot properly process it yet, but my only wish is that we actually get to see this relationship develop rather than it being something that’s dropped into the show, with the audience just expected to accept it without questions. The promising thing about it is that it does appear the writers are attempting to make this weird choice work, as Bonnie and Enzo spend a lot of time together in this episode snarking at each other and exchanging the sort of generalized banter that symbolizes a growing bond on this show. There is even a legitimate reason for them to interact, as Bonnie has to find Oscar so she can gather some information on how the whole “bringing him back to life” thing is going, and Lily has tasked Enzo to look after Oscar. It turns out that isn’t going so well, since the phoenix stone doesn’t actually bring people back to life so much as put a trapped soul of any old ancient vampire who is in the stone in that person’s body, unless you perform the spell correctly. So Oscar isn’t Oscar anymore (which is disappointing because Oscar was awesome) and then Oscar goes psycho and ends up dead. The bigger emotional stakes in regards to the phoenix stone are with Alaric and Jo, as Ric is forced to accept that the person in his wife’s body isn’t his wife at all. It’s heartbreaking for Ric, but more impressive is how the episode manages to make it heartbreaking for whoever is stuck in Jo’s body, too. Whatever old vampire this may be is completely disoriented by modern life, by this man who insists he’s her husband, and by the reflection they know is not their own. The moment Ric promises to help figure out who he or she is plays surprisingly well considering we don’t know anything about this person. It’s also a great moment for Ric, who went pretty far off the deep end trying to resurrect his wife and now sweetly agrees to help deal with the fallout, no matter how much it might hurt him in the process. 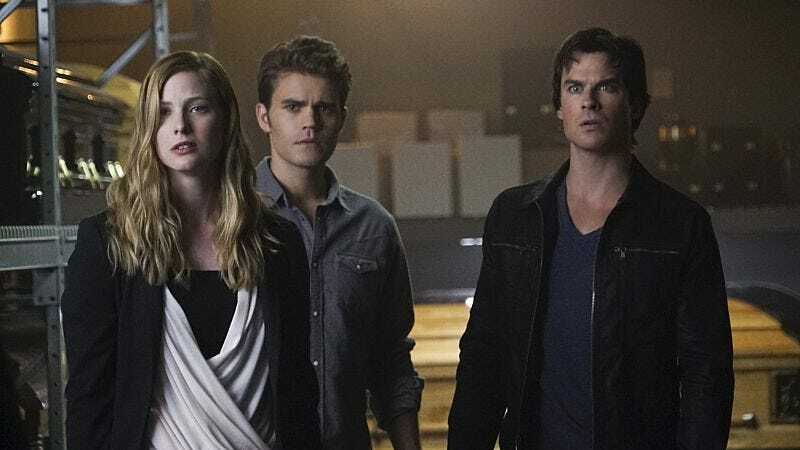 These are important moments, but the majority of the episode is devoted to Stefan, Damon, and Valerie and their quest to kill Julian before Lily can bring him back to life. Using this road trip as a setpiece to bring all the storylines together actually works very well; Valerie ends up being the one person who can connect all of the disparate dots of the different plot threads here, telling Damon what the phoenix stone does, warning them all about the evils of Julian, and finally telling Stefan exactly what happened to her all of those years ago instead of dancing around it forever. Even though the Valerie and Stefan story is fairly forced in its construction, it manages to at least deepen here because of this scene, and particularly because of Stefan’s reaction to the story. It was the present-day connection to the story Stefan needed in order for it to feel less manufactured, and even though this will surely cause the so-called love triangle to stick around, at least it will feel a bit more earned when it does. The most important part of this Valerie story has nothing to do with Stefan: It’s that it sets up the big reveal that Lily is the one who gave Kai the idea to put Elena in the coma in order to torture Damon. Why did she do this? Because Damon left her in the prison world. Lily is terrible, and this is the thing that finally makes Damon realize that he needs to kill his stupid mother rather than just avoiding her and letting her evil little minions destroy his entire town. It’s about damn time, Damon. Between this and Stefan’s vow to kill the newly resurrected Julian, this story sets up a great future confrontation between the Salvatore brothers and their terrible, no good, awful mother, and that kind of personal vendetta is the foundation of all great TVD stories. Let the matricide quest begin! I want Katherine to be the person trapped in Jo’s body. That is way to freaking awesome to actually happen. The Enzo and Lily story never, ever, ever worked, and I hope it is over forever. 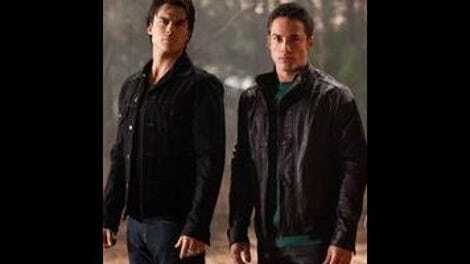 Join Stefan and Damon in killing Lily and Julian, Enzo. It’s where you belong.